Join us for an upland hunt where you'll see hundreds of birds each day. 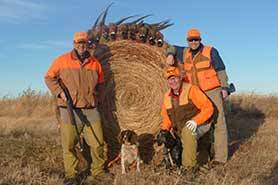 It is no secret that South Dakota pheasant hunting is the best in the world. Vast farm lands and tall grass prairies provide the perfect home for countless wild ring-necked pheasants. Johannsen Farms would like to invite you for an unforgettable outdoor adventure with some of the finest wild pheasant hunting the state of South Dakota has to offer. Our passion revolves around proper land, habitat, and wildlife management. We work diligently to create a genuine sportsman's atmosphere, allowing you to spend quality time with friends and family and enjoy the comradery of a great upland hunting experience. “The hunting was superb and the pheasants, as always, where in great numbers; healthy and mature. That's why I come back every year. You consistently offer what pheasant hunters everywhere dream about, an opportunity to see hundreds, if not thousands, of pheasants in a great South Dakota setting." "Thank you for such an awesome time at Johannsen Farms. I haven’t had such a great hunt in years, if ever! Amazing cover, tons of WILD birds, down home food and warm hospitality – you have it all. Hoping to hunt with you again next year and for many to come….Thanks Again."